Hi everyone. 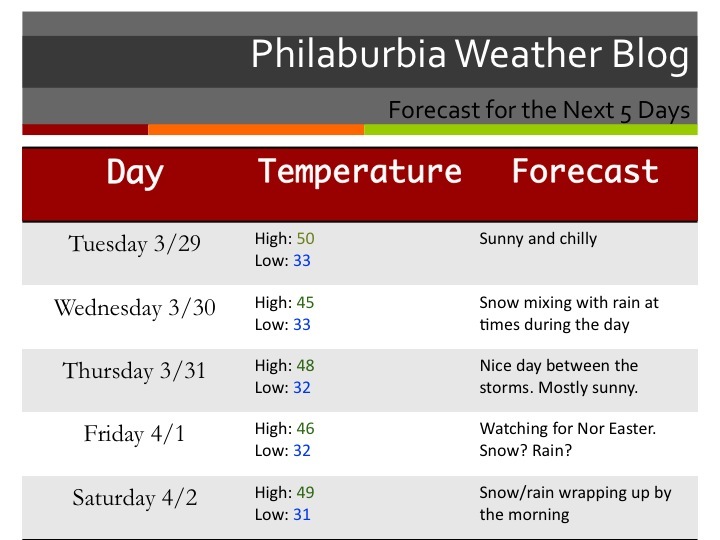 After over a year of doing Philaburbia Weather, I finally have a presentable 5 day forecast template that I will use. Okay, now to the weather. A very complex weather pattern is about to start with a possible 4 day period of storms. A few models are showing a storm on Wednesday. At this point, the general consensus is for this storm to ride out to sea and give us a few snow showers during the day on Wednesday. There is a chance that this storm heads further north and gives us a bit more snow than expected, but right now it is looking more like a minor event. The second storm on Friday is the one to watch. It has the potential to really cause major traffic problems in all of the major cities. It’s going to be a close call for the precip type. As of right now, it is looking to become a Nor Easter and give some sloppy wet snow. The snow will mix with rain at some point during the storm; the question is how much rain will actually mix? The GFS model (one of the most trusted mid range models) is giving us 3-6 inches of heavy sticky snow. Another model is showing a major rainstorm with totals climbing close to 2 inches. Keep a watch on this storm on Friday, because it could cause major problems for the Philly area. Ok and finally, my five-day forecast… in style (click to enlarge)!